My Munchable Musings: My Munchable Soapbox: Food Feminism? My Munchable Soapbox: Food Feminism? Happy Belated Valentine's Day. The day of chocolates and flowers, happy couples and pink/red hearts. But being the young, independent, and definitively single female that I am, yesterday did not exactly mirror that description (except for the chocolate...of course there was chocolate). It did, however, get me thinking about women of the past, and their role in the kitchen. Only half a century ago, a woman my age would likely have been married, perhaps with a child, and reliant on her husband for a living. 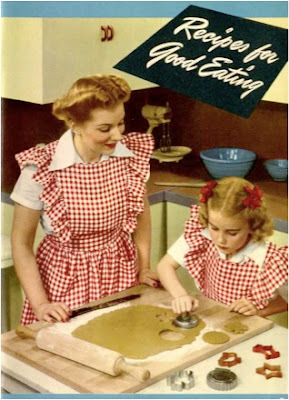 While the focus had been taken away from the kitchen during World War II, many young women returned to domestic living as it came to a close. However, there were still these conflicting values of the freedom found during the war and conventional views of the wife and mother. Enter the packaged foods industry. As a nation emerging from a great depression and a world war, the United States strove to demonstrate its affluence - the ideal single-family home, perfectly manicured lawn, and of course technologically advanced, yet traditional meals. Supermarkets and their easily prepared meals became a symbol of a great capitalist nation. The food industry recognized that many women had worked outside of the house during the war and might find it difficult to give up that freedom to return to being a housewife. 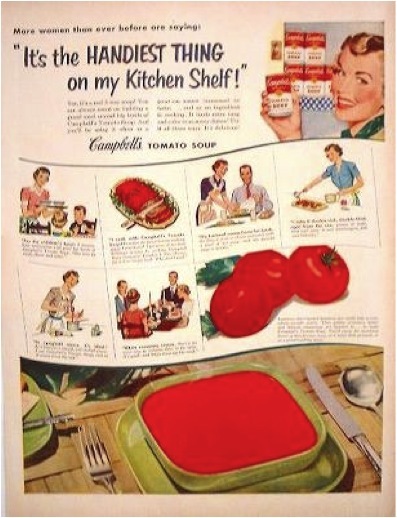 Convenience foods - such as pre-made crusts, boxed cake mixes, and minute rice - cut the time in the kitchen necessary to still fulfill a housewife's responsibilities there. One could actually argue that the processed foods, which made their way into mainstream during the post-World War II era, began to bridge the role of a woman as traditional housewife and the promising new opportunities waiting outside of the home. In retrospect, this also probably served as a stepping stone to the modern world of eating and the overwhelming reliance on canned, boxed, frozen, dehydrated, and otherwise altered forms of the nourishment once bought fresh from market. Even so, the prevalence of processed food and the cuisine that resulted because of it, ultimately helped women get beyond traditional practices in a most traditional way! Now it's not even a question. Who has time not to use frozen veggies, canned soups, and slice-and-bake cookies? It is interesting to consider, in this age of the 'modern' woman, that many of the foods I despise for degrading the quality and culture around meals, may have played key roles in reaching the level of freedom we experience today. And though it pleases me to no end that people (men and women alike) are headed back to the stove, I think it is important to recognize the significant role the advent of so-called convenience foods played in reaching the current state of gender roles in society.